Being an adult is weird: no one really knows how to do it. Everyone needs a little help sometimes, so I designed and made a zine about being an adult. 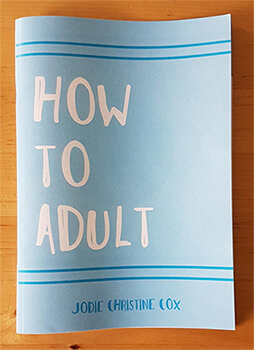 How To Adult is a collection of things I have learnt while at university, while living with parents, and while working from home. I have collected the most important parts of How To Adult and here they are for you! Being healthy. Everyone knows you should try to stay healthy, but your health is not just about exercise and what you eat. Sleep – try having some time without technology before sleep, make sure your sleeping environment is comfortable, and try to relax. Food – make sure you eat breakfast, stay hydrated, eat enough fruit and vegetables and try to reduce sugary foods in your diet. Sport and exercise – exercise doesn’t have to mean going to the gym; any exercise you do is better than no exercise at all. Try to walk or cycle places instead of driving, go swimming or running, investigate your local clubs and find something you enjoy. Alcohol and drugs – drugs and alcohol can affect your control of your actions and can cause your body to change. Don’t feel pressured to join in with others and, if you do join in, don’t do it every day. Allow your body some time to recover. Mindfulness – mindfulness is a way of approaching your thoughts and feelings that makes you more aware of them and helps you to react to them differently. You should give your full attention to what is happening in the present in a non-judgemental way. Stress – stress is a response to unusual levels of pressure and it can cause you to feel uneasy, tense and worried. Try to relax, learn something new, do something you enjoy, avoid caffeine and nicotine, and talk to someone. Budgeting. It is a word used a lot, but what does it actually mean? Keep on top of your bills. Prioritise what you need to buy. Shop around for bank accounts and find the best deal. If you are a student, some student accounts come with perks such as a student railcard. Don’t worry if you break your budget. Voting. It is something we are supposed to do, but what is voting, why should you vote, how do you vote, and who should you vote for? Voting allows you to have your say about issues and who should represent your views. In England, Wales and Northern Ireland you can register to vote at the age of 16 and you can vote at 18. In Scotland it is slightly different: you can register to vote at the age of 14, can vote in Scottish elections at 16 and in any other elections at 18. You should vote to have your say, but also because many movements campaigned for everyone’s right to vote. Voting means you can get politicians to work for young people and to solve problems for local people. By proxy – someone else can vote for you. By post – vote by post before polling day. In person – you go to the station, give your name and address to the staff and they will give you a ballot paper. Go to a booth and follow the instructions on the ballot paper, then put the ballot paper in the ballot box. There are many political parties in the UK, but no one can tell you who you should vote for. Read policies of the parties and make up your own mind. If you are having trouble deciding, there are quizzes online that can help you work out which parties most align with your views. First Aid. It can save a life. Some injuries are easy to treat, in the UK if the injury is minor you can call 111 for advice, but if the injury is serious you should always call 999 for help. In general, try to stop bleeding by raising the wound and putting pressure against it. Danger – check for danger to yourself or the casualty. Airway – open the airway by gently lifting their chin. 2 rescue breaths – open the casualty’s airway again and pinch their nose closed. Make a seal around their mouth with yours and breathe out steadily. Take a normal breath and then give a second rescue breath. Repeat until help arrives – 30 chest compressions and 2 rescue breaths. The internet. It is a fun place, full of your friends and silly videos, right? Not quite. You should be sensible and safe with your online activities. Think about what you post - if your social media profile is not private, anyone can read it. This could include your future employers, so think about your posts before you post them. Do not post anything you might want to get rid of later; once something is on the internet, it is there forever. Other people are not perfect – people only post the best versions of themselves online, so do not use their posts as a way to measure your life. Be nice – treat other people the way you would want to be treated, react by being nice and be yourself. Passwords – keep your passwords to yourself as they should be private. You should also use more than one password since, if anyone gets your password, they can only access some of your information. Strangers – strangers on the internet may not be who they say they are. If you decide to meet someone you met online, make sure you tell someone where you are going, meet in a public place and ideally do not go alone. Security – make sure your privacy settings are up to date and use some form of security on your electronic devices. Cooking. When most young adults have to fend for themselves, they go for ready meals or takeaways. Knowing how to cook means that you can save money and eat more healthily. Take some time to learn very basic recipes that are easy to change depending on the food you buy. Jobs. How do you go about getting a job? Before you look for jobs, you should work out what you want to do. Consider your skills, interests, style and values to find a job that is right for you. List your achievements not your duties. Say why you are great. Avoid typos, poor spelling and grammar errors. Tailor your CV to the job. Dress smartly and wear comfortable shoes. Research the company beforehand and practice. Speak confidently and give full answers. Friends. As an adult, making and keeping friends is hard, you have a full, busy life and so do they. The best way to meet new people as an adult is to join a club, have an open mind and meet people with different interests to you, this will extend your learning possibilities. Once you’ve met people, keep in contact, make plans and take interest in them. Respect. If you talk to others with respect, they will talk to you with respect. Well actually – do not assume that people do not know something, and only explain things to people if they ask you to. If they do not ask you, they probably already know about it. Stand up – if you see someone doing or saying something you do not agree with, stand up and say something to them. They are never going to learn if people do not correct them. Not your darling – stop using pet names for people unless they ask you to. They can belittle the person you are talking to and make them feel like they are less important. Consent – sexual consent is where a person has the ability and freedom to agree to sexual activity. An absence of an enthusiastic ‘yes’ means no. If you are unsure if someone consents, stop. Being an adult is tough and strange, but you have got to do it. For more advice and information, check out my zine: How To Adult, available to buy from my Etsy Shop. Jodie Christine Cox is a UK-based illustrator, specialising in children’s illustration. She sells cards, postcards and badges of her own designs and has recently designed and made a zine called How To Adult, with advice for 16-25 year olds.